In 1959, Hawaii became the 50th state to enter the union, and the United States became fully captivated with the Polynesian culture. Theme restaurants, motels, apartments and shopping centers popped up across the country. 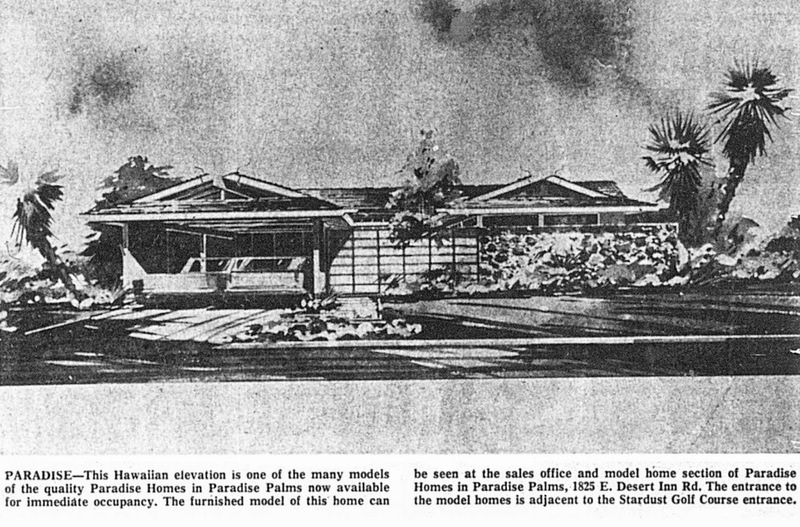 With the advent of the jet age tiki culture became attainable for the average American, and while massive resorts were being constructed in the Pacific Islands, homebuilders began offering Polynesian-themed single family homes to extend the vacation-lifestyle to everyday living. 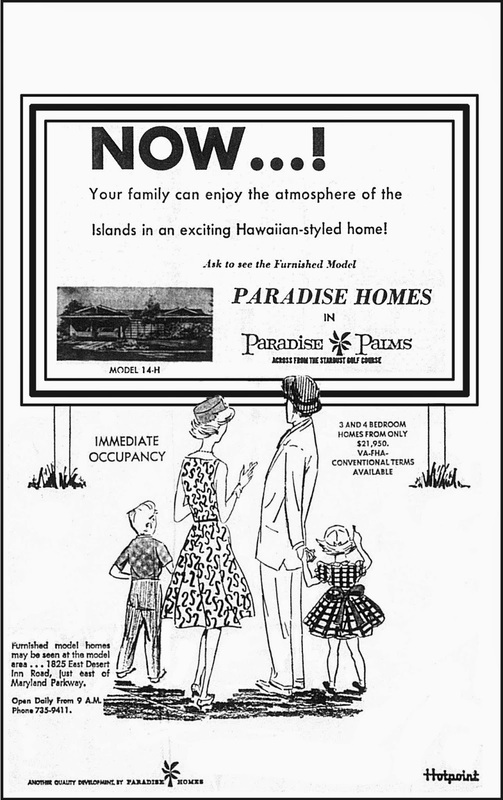 Within Paradise Palms, several builders embraced the mid century demand for architecture which capitalized on the romance of the Pacific Islands lifestyle. 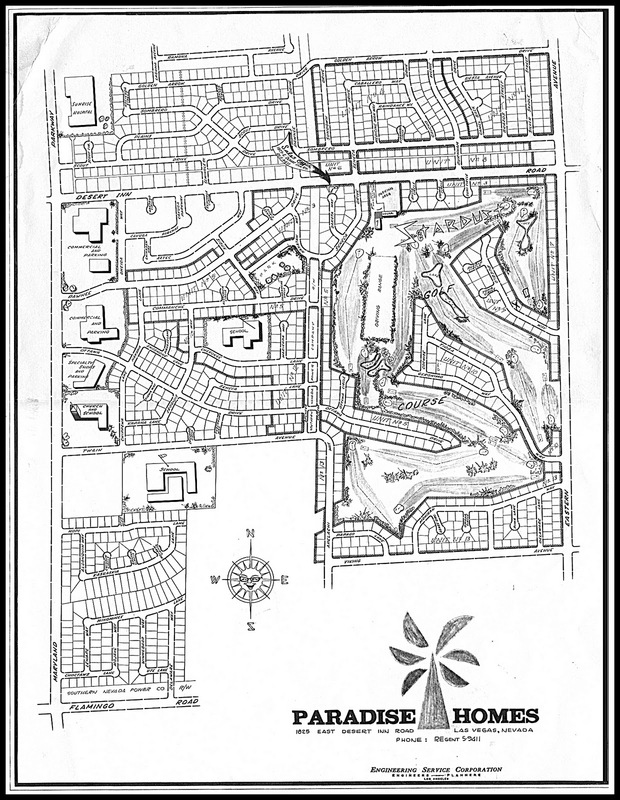 Most recognizable are the ‘H’, or ‘Hawaiian’ variations that Palmer & Krisel created for Paradise Homes. Starting with the Model 4, ‘H’ variations were produced in the Model 4H, 5H, 6H, 7H, 8H, 11H, 12H and 14H variants. Most popular was the Model 14H, of which approximately 9 were built, while the 4H proved the second-most popular with six homes built. Three each of the Model 6H, 7H and 8H were built. There is just one 11H, and the 5H and 12H have proved the most elusive, with none being spotted; although the non-Hawaiian counterpart of the 12 – the Model 12A, is nearly as rare with just four total homes built, while there a just over two-dozen varying Model 5s spread throughout the community – just none noted with the ‘H’ façade. Some of the hallmarks of the ‘H’ or Hawaiian-styled Palmer & Krisel homes include a steeply raked roofline, as seen on the 4H and 8H; the use of lava rock found on the 8H and 14H; pyramidal-shaped roofs found on the 7H, 11H and elusive 12H; wood shake shingles originally found on all models; exaggerated crossed beams designed to emulate outriggers oars as seen on the Model 11H and unseen 5H; and rooflines that features hipped rooflines with partial gable ends, as seen on the 4H, 5H, 6H and 14H. DL Bradley offered two home model variants in Stellar Greens with nods to the Polynesian influence on America. These homes featured low-slung hipped roof lines with partial gabled ends, lava rock accents, shake roofs and decorative notched beams. Americana got in on the Polynesian trends through the use of steeply raked hipped combination roofs, offering a slight nod to the Pacific Islands without being literal, and the occasional use of notched beams. In addition, there are a small handful of custom homes in the community which emulate the Polynesian trends which captured mid-century America. Like many trends of years past, the Polynesian influence faded from mainstream American culture by the time the 1970s hit. Consequently, many homes have been “de-tikified”, having many of their defining elements toned down. Luckily there are still plenty of great examples of homes here in Paradise Palms which embrace their Polynesian roots. astounding research - 100 more things to memorize about Paradise Palms. Thank you so much for these posts. Wow! My girlfriend and I LOVE the style of these homes. Retiring in a couple of years in OH..... We're coming to Vegas! Why do so many realtors push the west and south, tho??? Are neighborhoods like P.Palms and Huntridge on the move up?